Have a problem with the garage door at your home or business? Garage door repairs, replacements and service. Residential, commercial, industrial. We fix broken springs, cables, drums, garage door openers, transmitters, damaged panels, damaged sections, cracked window glass, photo sensors and more! Servicing all major brands including Lift-master, Genie, Sears Craftsman, Hormann, All-star, Amarr, CHI, Door-link, Overhead, Wayne-Dalton, Raynor and more! Need help? Have questions? Call now! September was a very busy month! Hormann Aries series door takes faux wood doors to another level. It's finally here! The side mounted operator everyone has been waiting for. The longly waited refresh of the popular 8500 residential jack shaft operator. The 8500w with integrated wi-fi and battery backup. The ultimate garage access solution, designed to optimize space. LiftMaster’s most advanced wall-mount opener optimizes garage ceiling space overhead, opening up possibilities to what your garage can become. Fully equipped with must-have features including built in Wi-Fi® for smartphone control, MyQ® Remote LED light, Integrated Battery Backup and the Automatic Garage Door Lock. Only the Hörmann Titan 4250 gives you the very best of safety, convenience and quality with unmatched innovations in modern technology. FingerGuard™ pinch resistant joints with environment-friendly polyurethane foam insulation, in between section seal and heavy-duty steel hardware offer you the most energy-efficient and safe door that will last. Take a full advantage of all the unrivaled premium features of a Hörmann Titan steel garage door today, tomorrow and for years to come. The Hörmann Tucana Collection offers the beauty of recessed panel design and unsurpassed safety of our pinch-resistant joints. The virtually maintenance-free Tucana Collection doors feature a tough steel front and back with polystyrene core, giving an R-value of 6.9. A wide range of standard designs is available to complement your home. Don’t settle with any other door that is a mismatch for your home decor. Choose a perfect match in Hörmann Tucana design collection that offers durability of steel and safety. The Hörmann Solaris Collection providesa modern look and maximizes the natural light in any garage. The 1¾” thick high quality glazing frames in anodized aluminum and wide range of design options have proven a winning combination designed for strength and durability. The Hörmann Aries Collection offers the durability and weather resistant properties of aluminum with the sophisticated appearance of natural wood. The virtually maintenance free Aries Collection features commercial grade extruded aluminum stiles and rails mechanically fastened at joints to create a high strength door frame. Surprise your neighbors with truly lifelike wood grain powder coated finishes without compromising the modern conveniences and the durability of an aluminum door. Custom wood carriage house doors. Hörmann Polaris Collection series doors are constructed from a fine selection of real wood handcrafted with careful attention to detail to provide a durable, prestigious and long lasting quality door. Natural wood offers a distinctive and unique grain texture that will give your home a special appeal. Choose from a wide selection of standard designs or create your own look from a simple yet elegant E-Series or the more sophisticated C-series. 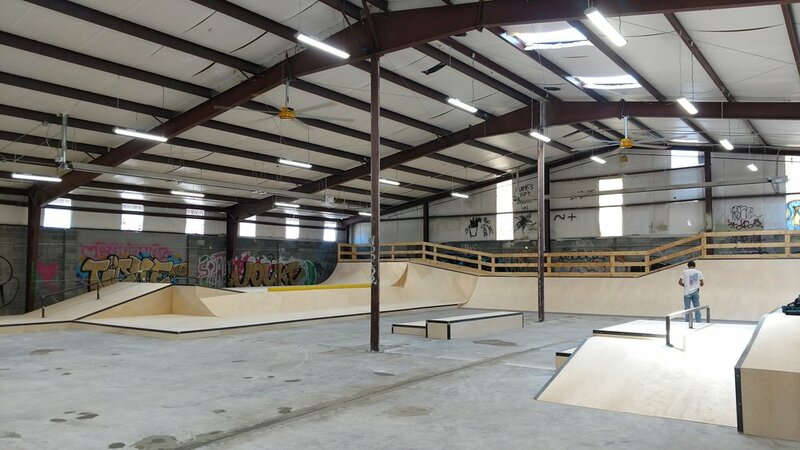 RAD Skatepark in the River Arts District. CLICK PHOTO FOR NEXT IMAGE. Was thrilled to have the opportunity to install the new door at the RAD park. The project looks very promising. Unfortunately not everyone is as enthusiastic about the park. The day after the door was installed, someone felt inclined to throw a rock through one of the panes of glass. Lovely surprise. AFTER 12 YEARS OF SERVING THE MOUNTAINS, IT'S TIME TO COME DOWN THE HILL! Highland Door is now serving Tryon and Columbus with a new location, and just like the original, no job is too big or too small. Specializing in old construction and new, let Highland Door Tryon take care of all your garage door needs. Springs, rollers, cables, off track doors, commercial and residential, Highland Door Tryon is ready to help! Currently we are using the same contact number for both locations, so give us a call!! NEW PRODUCTS!! Hormann has introduced two exciting new products to both their commercial and residential line of garage doors. And on the commercial side, the H-425U. Hörmann H-425U offers 1¾” thick two sided steel sections and100% CFC-free polyurethane foam core insulation for maximum protection against the elements. (R-value 16.1) Manufactured to the highest quality standards in the industry, all H-425U doors come with Hörmann exclusive FingerGuard™ pinch resistant section joints. We carry the Wayne Dalton 9800 designer fiberglass garage door. The construction is a steel on steel insulated door with a fiberglass veneer. " Wayne Dalton’s Model 9800 garage door is engineered with an artfully molded wood-grain fiberglass surface concealing durable steel construction. Made with Therma-Tru®’s AccuGrain Technology, fiberglass is as close as you can get to the warmth and beauty of wood with less maintenance. " This product looks remarkably like actual wood, without the hassle of the maintenance. Very impressive. Amazing house in Cashiers, NC. Doors by Horizon Carriage House Doors. The Liftmaster 821LM will retrofit most existing garage door openers and make them smart! - Monitor, open and close your garage door and control home lighting, all from a smartphone tablet or computer with MyQ® Technology. - Controls up to two garage doors at once (requires extra door sensor, sold separately). - Controls up to 16 MyQ®-Enabled devices. Chamberlain goes from the garage to the front door with Notifi!! The Notifi is a way to get video from your front door. It consists of an LED light and a video camera that is attached to the light via a wire. You screw the light bulb into your porch light by your front door and the socket provides power for the video camera, which you then clip to the light’s fixture. The idea is when motion triggers the camera as someone approaches the door, you get an alert and a picture on your smart phone. If you want video, you click a button on the app and it starts transmitting. The Notifi uses Wi-Fi to transmit the video. Ever thought about repairing your garage door yourself? Granted, there are many aspects of your door that are safe, and even recommended for you to service yourself. Lubrication for example. Lubricating rollers, springs, cables and hinges are perfectly safe for any homeowner to tackle. Even tightening hinge bolts is a safe DIY service. However, adjusting or replacing springs, rollers or cables can be extremely dangerous, and is best left for professionals. Your average torsion spring can lift 150 pounds off the floor with ease, imagine what it can do to a hand or arm! A $75 dollar service call will seem like pennies next to the possible medical bills! Mike and Greg of Horizon Carriage House Doors, installing the weather seal. New for 2013! Highland Door will now be offering Wayne Dalton residential garage doors! Offering an even more diverse selection of steel and fiberglass doors. If you can dream it up, they can match it! Serving Asheville, Hendersonville and all of Western North Carolina. I am going to start reviewing home improvement products here that I find useful, intriguing and innovative enough to purchase myself. I am starting this with the Nest learning thermostat. The man who created the iPod and guided the first three iPhones through production has designed and invented the worlds most advanced 'smart' thermometer. By 'smart' I mean it learns all your heating and cooling trends and eventually becomes self adjusting. You just use it as a regular thermostat at first, turning the air down when you get home from work, or turning the heat up a little when you step into the shower in the morning. The concept is very exciting. It’s called the Nest Learning Thermostat, and on the outside it looks utterly familiar apart from its brushed metal shell: it’s just a round silver dial with a color LCD display in the center that mostly just displays the temperature in large, friendly numbers. Like any other thermostat, you set it just by turning the dial, and the display turns red or blue to indicate whether it’s heating or cooling, with an estimate of how long it’ll take to hit your desired temperature. A green leaf appears on the display when you’ve set it to an optimal energy usage setting; the idea is to make users "search for the leaf" and thereby save more energy. It is a deceptively simple product. What you don’t see are the two motion sensors, temperature sensor, and the Wi-Fi connection that tells the Nest what the outside weather is like. The more you adjust the dial and simply live in your house, the more the Nest learns about your preferences and schedule, and the more it programs itself to properly control your heating and cooling — and the more energy you save. On the software side, the most impressive new feature might be System Match, which learns not just your schedule, but the idiosyncrasies of your home. For example, if you live in an old Victorian with a decades-old heating system, Nest will learn that it takes your house longer to warm up than, say, a new construction. So, once it knows how long it takes your heating system to reach a given set point, it can turn up the heat further in advance so that you don't wake up to a chilly house. I just got and installed this device. The installation and setup was incredibly easy. This unit is supposed to be compatible with 95% of the existing heating/air systems out there. I will report on this unit as it learns. We share two passions here at Highland Door Company, garage doors and consumer technology. This product from LiftMaster is the perfect mating of the two. The LiftMaster 8550 Elite series has all the durability and reliability that the industry has come to expect from the Chamberlain Corporation, yet still possesses the cutting edge technology that sets this operator apart from the competition. The basic mechanical design is very similar to all Chamberlains products of the last 30 years. The main difference is a high output DC powered drive motor. This DC motor allows for low voltage, silent operation and most importantly a 12v battery backup. The operator monitors the battery charge and power supply. When the main power fails, the battery automatically kicks in, allowing for multiple emergency door cycles. Very handy in a pounding rain storm. Where this unit really shines is the MyQ technology that Chamberlain is incorporating into their high end residential garage door openers. This allows you to operate your garage door opener, interior lamps and any lights that are connected to a standard single pole light switch from the provided remote control or the LiftMaster smartphone app. Its not quite as cut and dry as this, but its pretty simple. The first thing you need is the 828LM Internet Gateway. This is the internet connection if the system. Plug it right into your existing internet router and you are ready to go. The LiftMaster app is available for free from the Apple App Store or Google's Play store. Not sure about Blackberry or Windows Mobile, but really, who is using them anyway? After downloading the app and adding your gateway to it, the app allows you to cycle and monitor your garage door from anywhere your phone has access to the internet. So you leave in the morning, and cant remember if you closed your garage door, just fire up the app and see. If you left it open, just tap the door on the screen and it magically closes! As mentioned earlier, you can also control any of the lights in the house using this system. The 823LM Remote light switch and the the 825LM Remote light control can be used to replace existing light switches or be added to any lamp or corded appliance you could possible want to control from the beach, woods or bar. Setup is literally as easy as pressing a button. I was astonished. At present time, my phone is set up to control our front porch light, living room light, exterior floodlight and out garage door opener. The only limitations I have encountered have been network related. If your phone, God forbid, only has access to a 3G or Edge network, your access times are going to be terribly slow, if they work at all. But, if you are connected to a strong 4G network, the app is snappy, responsive and the lights and door operate almost as quick as you can tap your screen. I really is quite a product.